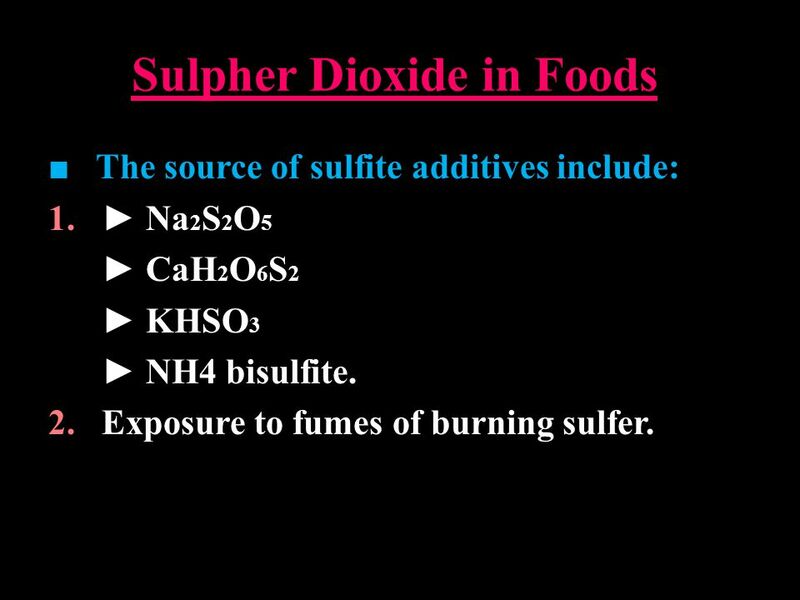 Sulpher Dioxide in Foods ■ Sulfuring: The process by which sulfite is applied to food. The sulfite in diet occurs mainly as food preservative. 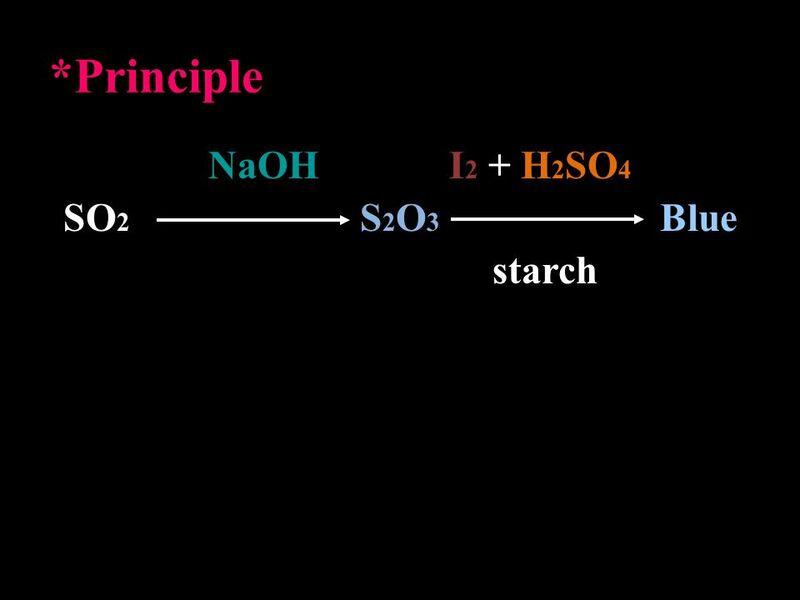 1 Sulpher Dioxide in Foods ■ Sulfuring: The process by which sulfite is applied to food. The sulfite in diet occurs mainly as food preservative. 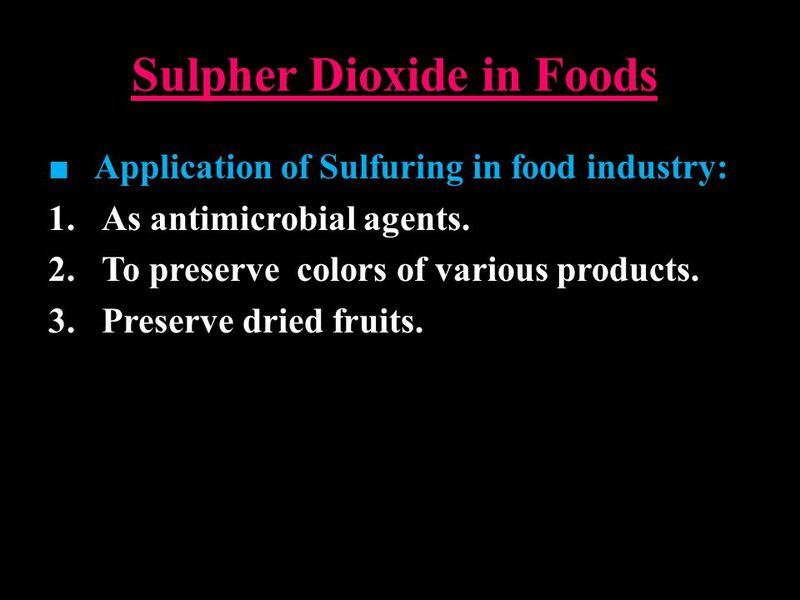 2 Sulpher Dioxide in Foods ■ Application of Sulfuring in food industry: 1.As antimicrobial agents. 2.To preserve colors of various products. 3.Preserve dried fruits. 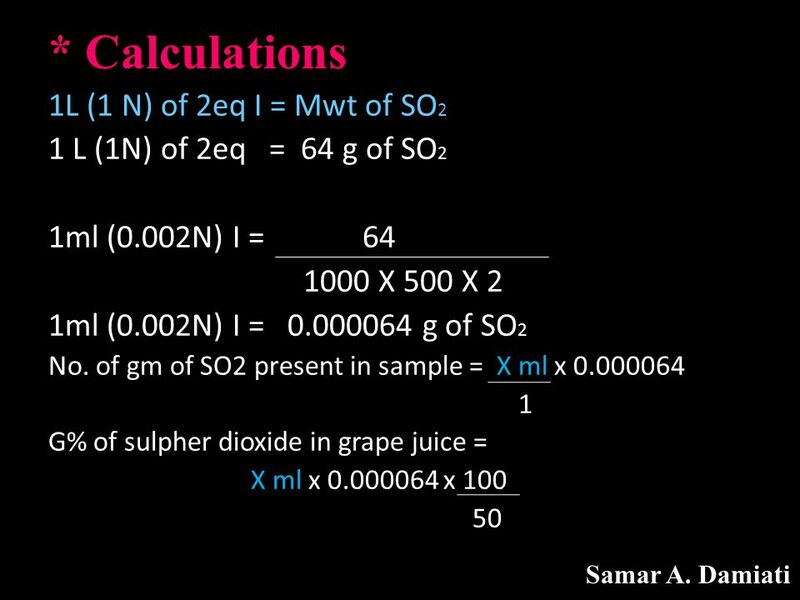 3 Sulpher Dioxide in Foods ■ The source of sulfite additives include: 1. ► Na 2 S 2 O 5 ► CaH 2 O 6 S 2 ► KHSO 3 ► NH4 bisulfite. 2. Exposure to fumes of burning sulfer. 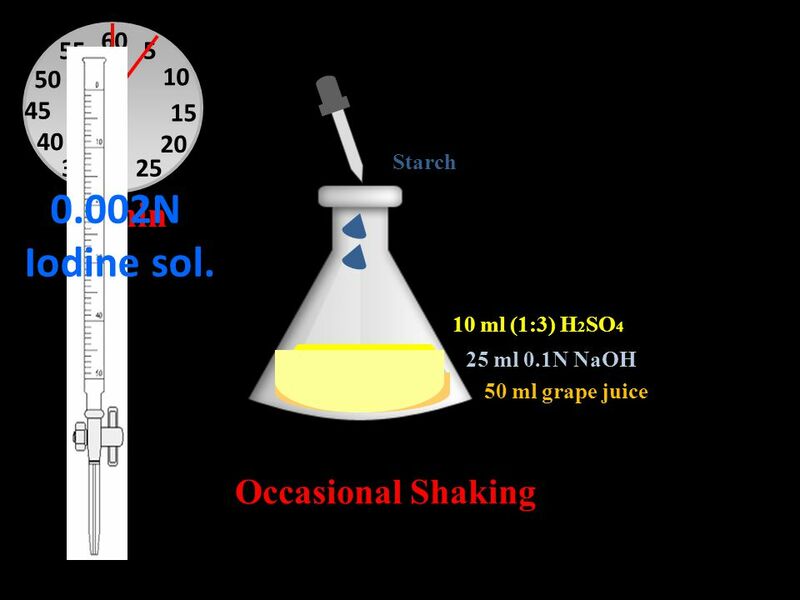 6 50 ml grape juice 25 ml 0.1N NaOH Starch Occasional Shaking 10 ml (1:3) H 2 SO 4 60 30 15 45 5 10 20 2535 40 50 55 15 min 0.002N Iodine sol. 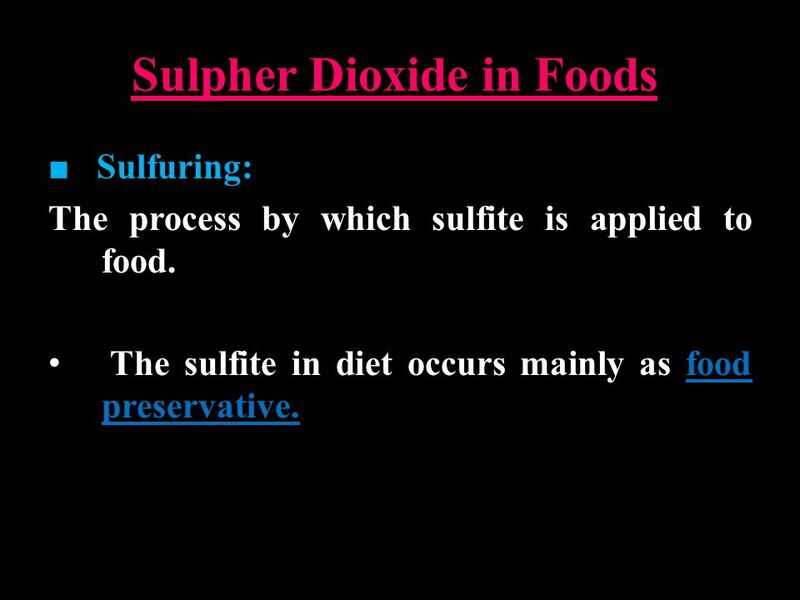 Download ppt "Sulpher Dioxide in Foods ■ Sulfuring: The process by which sulfite is applied to food. 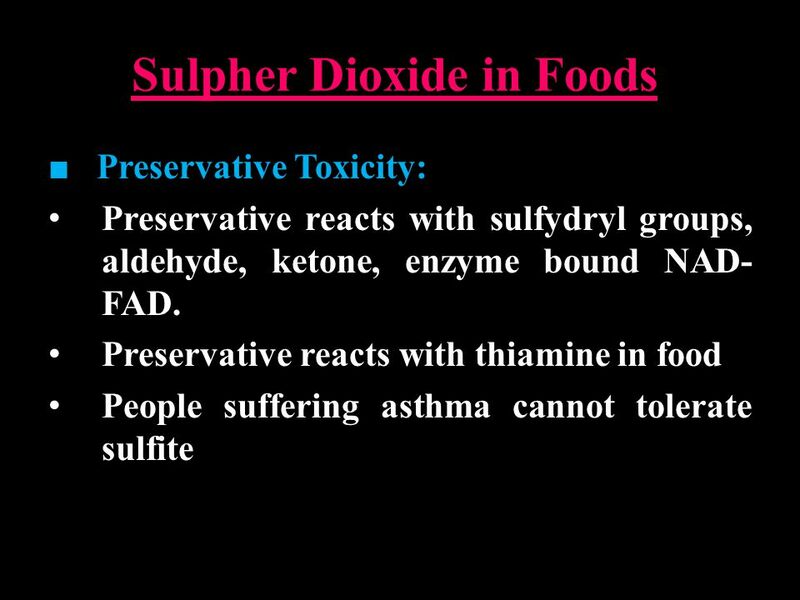 The sulfite in diet occurs mainly as food preservative." Aldehydes and ketones. Aldehydes and ketones can be structural isomers of each other. Aldehydes are produced by the oxidation of a primary alcohol and. Chemical Tests for Glucose, Starch, Proteins and Fats. C h e m i c a l R e a c t i o n s. C h e m i c a l R e a c t i o n A p r o c e s s i n w h i c h o n e s u b s t a n c e i s c h a n g e d i n t o a n.
Summary of Experimental Procedure. Safety Warning ! Strong Acids and Bases, Halogens Wear safety glasses and gloves when handling with chemicals in a. 1. All living organisms are composed of four classes of macromolecules:  Carbohydrates  Lipids  Proteins  Nucleic acid 2. Calorimetric Determination of Glucose by the 3,5-dinitrosalicylic acid Method Several reagents have been employed which assay sugars by using their reducing. The assay of Tissue Glycogen Glycogen is a polysaccharide of glucose which functions as the secondary short term energy storage in animal cells. It is. Lab Activity 6 A) Peroxide Value Determination B) Formation of Acrolein C) Saponification IUG, 2015 Dr. Tarek Zaida 1. MILK. 1) Adultration of milk 1) Adultration of milk Objectives: To detect any adulteration of milk. Introduction and principle: One of the most common. Unknown Foods: Macromolecule Lab Chapter 2: Carbohydrates, Lipids, and Proteins. Lab Activity 6 Lipids Alaa Baraka IUGMarch2013. Lab Activity Peroxide value determination. Peroxide value determination. Formation of Acrolein. Formation. . They are substances that are soluble in lipid or derived from the lipids by hydrolysis; for examples, cholesterol and fat soluble vitamins. FACT FILE 2: THE PROCEDURE FOR THE IODOMETRIC TITRATION OF COPPER © Barreiro,L. ; Navés,T English Revision: Bedford, N.